Other high security products such as Razor wire, Barbed wire and Front/Side fixing brackets are available to purchase by contacting the store directly on 01204 578012. Razor wire is the modern version of barbed wire, designed to prevent intrusion along per meter barriers . Razor wire is fabricated from high tensile wire (virtually impossible to cut with standard tools) onto which a multitude of razor – sharp barbs are formed at close intervals. 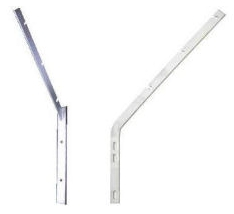 The Cranked Brackets available are Front fixing Cranked Brackets, Side fixing Cranked Brackets, all of which are designed to be attached to a wall or fence and uphold razor wire. Razor wire is the modern version of barbed wire, designed to prevent intrusion along per meter barriers . Razor wire is fabricated from high tensile wire (virtually impossible to cut with standard tools) onto which a multitude of razor – sharp barbs are formed at close intervals. The barbs are designed to have a piercing and gripping action. The wire and strip are galvanised to prevent corrosion. A single coil of Razor Wire fixed to a standard fence provides a good deterrent as it also hinders the would be intruders exit route. The two most common forms of razor wire are in concertina style and also Flatwrap™ style. The benefits of the innovative Flatwrap™ style over the more traditional concertina style are that the width of the coilis reduced significantly to just under 10mm with substantially more security. Barbed Wire is constructed from steel fencing wire, with sharp barbs integrated at intervals and is generally used around the tops of walls or private property. Barbed Wire is designed to catch clothing of wouid be intruders or to prevent the escape of farm animals from a secure area. 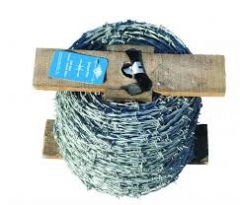 All One Stop Fencing Products Ltd Barbed wire is supplied in 200 meter coils, which provides alot of coverage. All Barbed wire provided by One Stop Fencing Products Ltd is galvanised as standard to help prevent rust and corrosion in harsh atmospheres and also maintain longevity so that the Barbed wire will stand the test of time.